According to Dr. Wilmer J. Miller of Iowa State, the domestic ringneck that has been kept for perhaps thousands of years originated from the rose-gray (rosegrisea) species of north east Africa (the nominate variation). These birds have been bred in cages since biblical times as pets and for magicians’ acts. The ancient keepers of doves apparently liked the white and blond versions of these birds and got rid of the ones having darker colors. But in recent times breeders have managed to retrieve the darker colored birds as well as develop a number of new colors. These birds have been widely studied and used in genetics research since the end of the 1800’s. Today there is more than 40 distinguishable color patterns. Thirty eight color patterns are presented in Professor Bob Lockhart’s book, Ringneck Dove Colors (6) published in 1999. Derek Goodwin provided separate descriptions for the Barbary dove and the African collared dove in his book Pigeons and Doves of the World (4). For the Barbary dove he used the scientific name Streptopelia risoria; and for the African collared dove he used the commonly accepted name of Streptopelia rosegrisea. He explained that it had been customary to give the Barbary dove a separate species name even though taxonomists considered this incorrect. He justified the use of this name because this species had been subject to so many observations and experiments throughout the world in the past. Dr. Matthew Vriends in his book Doves, A complete Pet Owner's Manual (1994) (10) used the scientific name of Streptopelia rosegrisea var. "risoria" and did not make further comment on his naming convention. Dr. Danny Brown in his book, A Guide to Pigeons, Doves, & Quail (1995) (1), uses the name Streptopelia "risoria" and also did not further comment on the naming convention used. Gibbs, Barnes, and Cox, in their book Pigeons and Doves of the World (2001) (3), did not describe the Barbary dove. They only included the African collared dove and in their description made no reference to the domesticated dove. 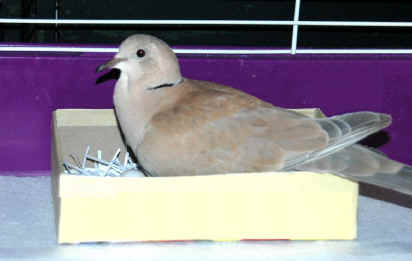 Adult African collared doves' coloration of the upper parts is a pale grayish fawn with blue gray along the wing edge. There is a black neck ring extending half way around the neck on the back of the neck. Chin, belly, and under wing are whitish in color. The orbital skin a narrow white ring, and the iris dark red. The bill is black and the feet are red. The natural range of the African collared dove is in the savannah lands south of the Sahara Desert in Africa from Senegal and Mauritania in the west across the continent to Sudan and Ethiopia in the east. They are also located along the Red Sea coast in Arabia and in Yemen. The African collared dove constructs nests in small trees and bushes, not very high above the ground. Two eggs are laid one or two days apart and then incubated for 14 days. After hatching the parents feed babies with "pigeon milk" which comes from the lining of their crops. After a week or so the parents begin to add seed to the diet. In three weeks the babies are on an all seed diet and usually fledge, however they are not self sufficient yet. The parents' will continue to feed them for another week as they learn how to find food in the wild. The white dove is a color mutation of the African collared dove/Barbareydove that has been around for perhaps a thousand years. They have been bred in cages since biblical times. 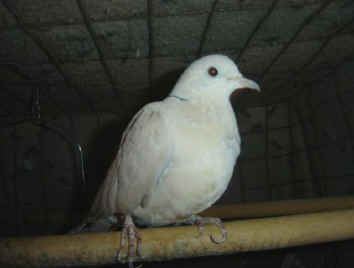 The albino ringneck dove was imported from Japan in 1967. These birds are pure white and are reported to be without neck rings. See the photo of the bird below. However if one adjust the brightness and contrast settings on a photograph we found that the normally invisible neck ring can be made to appear. See the second photo below. 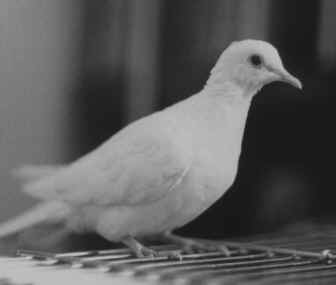 Many of the people who write are people who have found white doves in various locations as the result of improper dove releases for weddings and other functions. Homing pigeons are the appropriate birds for such releases as they will return to the owner’s loft after their release. 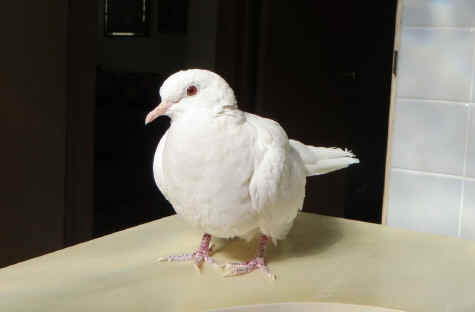 White doves are often used though because they are much cheaper to breed than homing pigeons. However they do not have the ability to return to the owners loft and thus end up in the wild. They often are not able to find food having had it provided to them all their life and because of their white color they are easy prey for a variety of predators. Thus many of these released birds die or are killed in a relatively short time. After she had been with me several months she taught herself to fly from her cage across the living room to the top of some book shelves on the far side from her cage. Her method was to brush the tip of her right wing against the wall and move forward at a slow speed. When she sensed she was close to the far wall she would make a left turn and descended until she touched the top of the bookcase. Some landings were gentle but others were rather hard. On the return trip she would fly straight across the room without touching the walls. I felt she was able to so this because there was a bright light just above her cage. She usually managed to descend enough so she could land on the surface of the cage table in front of her cage. 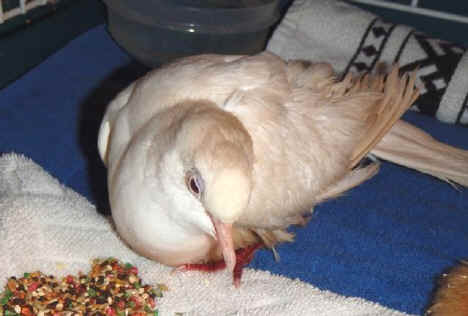 Many white doves that have been released end up looking to humans for assistance. 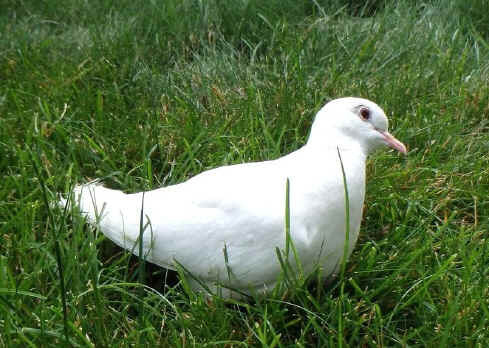 Many people have written in with stories about how they acquired a white dove. Some have told how these doves flew in open doors of their homes and one lady told how a ringneck landed on her wrist as she was unlocking her front door. Many have been found walking outside, too weak to fly away, and are thus are picked up, often by children. And many of these people, not having an experience in keeping birds, have written me for advice about keeping such birds as pets. Update: June 2007: Our white dove turned out not to be a ringneck dove after all. After we had her a year we discovered that she was actually an Eurasian collared dove. This was determine by her call and occasional scream. I was not familiar with the ECD's call although I have heard the call around town and in other locations. I thought the birds I was looking at were ringnecks. But many people had been writing in about the ECDs and Dr. Wilmer J. MilIer, the ringnck dove expert, told me about the call and scream and also told me I could identify the ECD by dark spikes on the underside of the outer feathers. Since this bird was white it has only the faintest dark spikes on the underside of the outer tail feathers. The question was if she was a pure white Eurasian collared dove or a hybrid from the mating of a ringneck dove and the Eurasian collared dove. I am guessing that someone who was breeding white ringnecks for wedding releases took in some ECDs and ended up with some white ECDs. For more information on Eurasian collared doves click here. 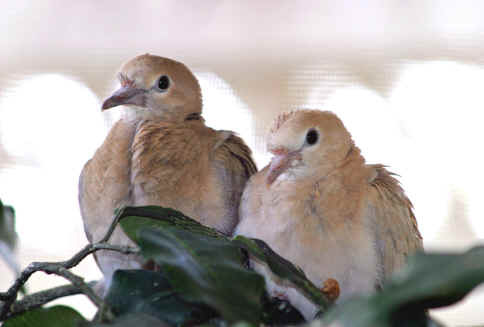 This page was developed in response to a number of requests for information about ringneck doves that was received during the spring of 1999. My personal experience is only related to two birds, a single male ringneck dove I purchased for my niece in the fall of 1990 from a hub cap dealer and a young white albino ringneck dove given to me by a bird rehabilitator in 2006. Thus this page is based upon the experience I have had with these two birds and information from the few books I have listed as references. For those who are interested in seeing a list of the different color variations click on the link (left side menu) to the Dove Page prepared by Wade Oliver and go to the ringneck species. Mr. Oliver has a complete illustrated display of the known color variations. The following information is provided for people who have acquired a single dove. No information is included regarding nesting and raising babies. If that information is needed you can refer to the page for the mourning doves and the one for diamond doves on this site or you can obtain one or more of the books included in the reference section on this page. In the fall of 1989, I purchased Brownstone from a hub cap dealer since there were no other breeders in this area at the time. 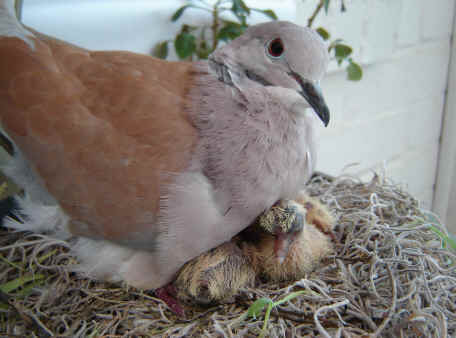 We asked for a female but within several months the dove’s bow coos made it obvious that we had a male. The birds was not tame at all when we brought it home and in fact it seemed angry. It was quite willing to peck us when it was handled and it rejected treats by tossing them across the room. Holding the bird was not easy and the only way to catch the bird to return it to its cage after free flying was to tire it out. I now wonder if the bird had been abused. But within a year the bird adjusted to our whole family and bonded on my niece. It only was kept in his cage when no one was at home and otherwise it learned to stay in the kitchen unless someone took her out as stools were accumulated in one place and cleaned. He was easily picked up and held and was quite willing to lay on any of us while we sat and watched television. In a a few more years my niece had trained him to come on command. If my two nieces faked a fight between them the ringneck would defend my oldest niece by attacking the other. Brownstone was notorious for doing non-stop bow coos for most of the day. It seemed he would only stop for eating. He would do bow coos for family members hands, feet, and various possessions like a pocketbook. He would go around to every mirror and reflective device and do bow coos to his own image. He has done bow coos for a small teddy bear and other stuffed animals. And he will even mount and "mate" with certain objects if allowed. The noise level can be loud enough to interfere with conversation, telephone calls, or listening to the radio or TV. In fact it can nerve racking, but he will stop if you pick him up and give him a hug. I definitely would not recommend obtaining a single male ringneck if you are living in an apartment. Dr. MIller recommends a minimum cage size of an 18 inch cube as suitable for adult ringnecks. This size provides the birds with room to stretch their wings. He also suggests that a 24 inch cube is suitable for a pair of birds that are raising their offspring. Many people keep their birds in outside aviaries, especially if they have several pairs. While large aviaries have the advantage of providing a more natural environment for the birds including room for flight and also ease of maintenance, there are some disadvantages including adverse weather, predators, and much easier infection from disease and parasites. 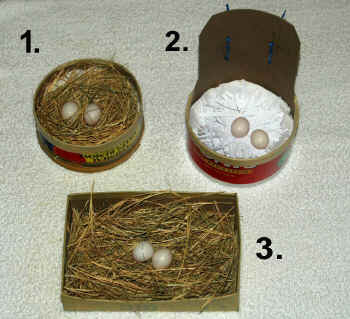 Often several hens will often lay their eggs in one nest box and at first share incubation but later tire of the chore. And then males often become aggressive and will fight. Ringnecks kept outside need a somewhat heated, enclosed space to roost in the winter months depending on the climate. Wire spacing on the cage walls and roof should be one inch apart. 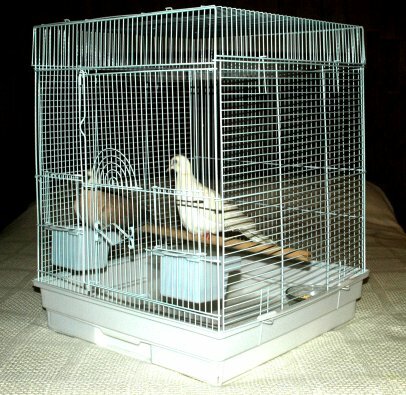 Most people use two perches in a cage one low and one high. One perch should have a larger diameter than the other. The high perch should have adequate headroom for a bird to perch on it Perches can be round allowing the bird to grasp them or flatter surfaces that allows a bird to spread their toes and also cover them with their feathers when it is cold. In outside aviaries that are located in the colder climates where freezing temperatures may be encountered, flat perches are necessary to prevent the freezing of toes. Perches should be positioned to that droppings form birds sitting on the perches do not tall into the nest box or drinking water. Seed, grit, and water containers can be of various designs but it is most important to have designs and/or locations that will prevent the contamination of the contents by bird droppings as this can cause and facilitate the transmission of a wide variety of diseases and internal parasites. If you find droppings in and food or water contained then something needs to be changed. I prefer to use glass water containers to avoid water that is contaminated by plastics or other chemicals. I have been using a simple plastic contamination shield to protect water dishes form droppings. Instructions for the construction of a shield can be seen on the Caring for Diamond Doves page of this site. Seed containers should be designed to prevent seed wastage because the birds like to throw seeds when they are looking for that best seed that they never find. Some use a wire grating over the top of the seed and others use seed containers with snap on lids that have small openings in the top. The standard food for ringnecks is millet, canary seed, hemp, milo and wheat. Greens and a calcium supplement are also recommended. (9) Ringnecks will also eat a wide variety of human table food. Some people say the wider the variety of food provided, the healthier will be the bird. We feed one of our ringneck pellets on the advice of a veterinarian who maintained that once he convinced clients to convert their birds to pellets, they never had to bring their bird in for illness again. One of our birds, Brownstone, is now at least 19 years old (2009) and as far as we can remember he has always remained in perfect health. But then ringnecks are known to to be hardy bird and are rarely sick if kept inside. However I have noticed that birds fed entirely on pellets often weigh much less than those fed on seed. Recently I was keeping the ringneck in my apartment and weighed it when my daughter first brought him over. He weighed 150 grams which is on the low side of the range of 150 to 200 grams given by Danny Brown (1). After having been given the opportunity to eat seed for 11 days he reached a weight of 175 grams. The photograph below shows the three types of cheap nest boxes that we have use as well a natural nesting material and artificial nesting material. 1. This box is made from a 48 oz. oatmeal container. It has a diameter of five inches and the inside height is 2.25 inches. It is placed on the cage floor. It could be weighted or attached to the cage wall to prevent tipping. It is placed on the cage floor. This next box has natural nesting material inside. 2. This box is also made from a 48 oz. oatmeal container. It has a "backboard" to allow it to be attached to the cage wall at some height above the cage floor. The rim of the nest box should be positioned below the highest perch to prevent the birds from perching on the box and soiling the contents. Artificial nesting material made from strips cut from 3 x 5 cards are inside this next box. For information about nesting material, click on Caring for Diamond Doves page on the left side menu. Sometimes parents reject their babies because of some perceived defect that we humans are not able to see. Breeders often believe it is best to not continue with those babies. However, I have gone ahead and handfed such babies and found that they grew up and functioned normally as far as I could see. I should note my experience has been with diamonds, not ringnecks. It is recommended that dove chicks be maintained at a temperature of 95.0 to 97 F to optimize the metabolism of their food (1). Temperature can be controlled using a lamp with an adjustable arm. A thermometer should be used and checked frequently as room temperatures often change significantly during the day. A small bowl of water near the container use to house the chicks can be used to provide the necessary humidity. Day 28 to Day 30 - Babies should probably be removed from the parents' cage to avoid being attacked. As stated elsewhere on this site, Roundybush's Squab Formula is made for doves and usually results in the best growth as it includes proteins and fats not included formulas made for other birds (1). Kaytee's Exact can be used, but the growth will be less than optimum. Another possibility is Gerber's High Protein Baby Cereal (7). Although it does take some time to tame a ringneck dove that has not had close contact with humans, my feeling is that they will become a very warm and affectionate companion of the owner who spends time with the bird and does not confine the bird to a cage when they are home. Tame ringnecks like to be near their owner and will express their affection in many ways. Last night my daughter and I were watching a movie on the computer and after messing around with the diamonds for a while she came and landed on my daughters chest and snuggled up under her chin occasional shaking her wings and giving low coos. Later we were playing chess and he landed on my shoulder and snuggled down flat and went to sleep, occasionally waking up and preening his feathers. He stayed there on my shoulder for over two hours. When it gets to be about 11 pm or so, he will come to one of us and land on our heads. We have learned that this is the signal that we need to turn down the bright lights so he can go back to his cage and go to sleep for the night. Many people, particularly those who live alone, keep a single ringneck as a "companion" bird. They are far more affectionate the most cats and are much cheaper and easier to keep than a dog. In regard to our own experience to tame my daughter's bird as I recall now it was a long and discouraging process. The bird seemed to be angry perhaps because the way it was treated before we got it. When offered food he did not just refuse it but rather threw it back at us. 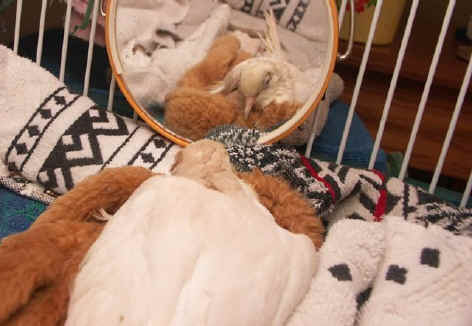 Other than that it took six months before he transformed himself into the loveable bird that he has today. 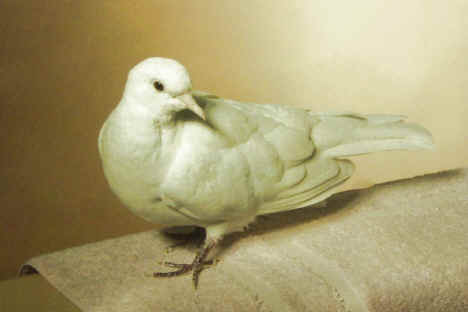 I had another dove that was given to me and I did not have much time to pay attention to her. But I did allow her out of her cage when I was home. At first she explored the carpet looking for spilled seed but within four days she was up on my desk watching me work on the computer, Since I ate meals at my desk, she soon felt she needed to share them. She soon was eating all kind of human food if I cut the pieces small enough. Within a few months she was tame enough to fly to me when I called her. We have had the white albino now for about six months and in some ways it was fairly tame when we got it as it would sit on one's finger, or snuggle down in one's hand, but she was and continues to be easily spooked which we suppose is related to her blindness. Many people write with questions about how long ringneck doves will live. While the usual life span of a ringneck dove is around 15 years or so, I have heard that some people's pet ringnecks have lived into their mid thirties. Here is an accounting of four ringnecks that I know of that have lived more than 20 years. 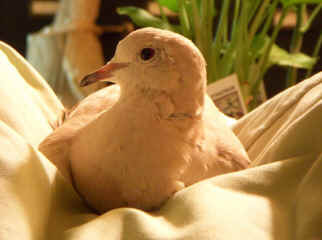 Our ringneck dove Brownstone was purchased in January 1990 for my niece who was just starting high school. We figured he hatched out the previous spring which would make him 21 years old sometime this spring.(2011). He was kept as a single dove throughout his life by my niece. He had a pellet diet from his sixth month with us until he came to live with last year. He moved in with me and my doves because my niece married and her husband had two large dogs. Although offered his regular pellet diet he chose to eat the seeds that my other doves eat. He has a lame leg that causes him to limp but still is a strong flyer and often is able to hover in place. Dr. Wilmer J. Miller of Iowa State had a bird that lived for 27 years, 10 months, and a week that died on December 6, 2000 She had raised 221 offspring during the first 18 years of her life and then she fostered a number of other chicks after her eggs were finished. This dove was the oldest one out of the hundreds that were raised as part of his genetic research projects. 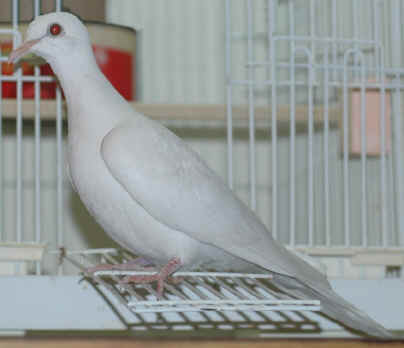 Sharon O'Connell of Chicago, Illinois was given her white ringneck dove by friends while she was a senior at Southern Illinois University at Carbondale. Her friends owned the dove's parents. Sharon named her ringneck Opal. Sharon thought he was a female but in time his bow coos dispelled that idea. The baby hatched out on November 25, 1983 making him 27 years old on Thanksgiving Day 2010. 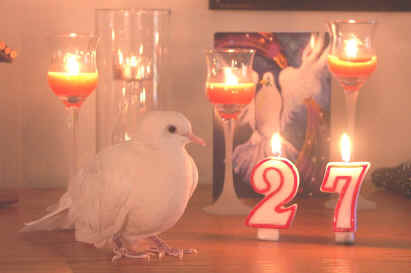 The photo below was taken at Opal's 27th birthday party. Sharon says she has feed him 1/3 canary seed and 2/3 finch seed all his life. She never gave him any vitamins. The only other maintenance included the clipping of nails and an occasional bath in the bathroom sink. And the bird has never been sick or injured and thus had never been to a vet. Now that he is older, the only sign of aging seems to be a wheezing as he flies around her home and gasping for air. But then Sharon comments that most of us have these problems when we age. Opal seemed to stay strong and healthy until mid May 2013. At that time he seemed to have suffered a stroke. During the summer he slowly deteriorated and by July he was limping and not really flying. That was why they were able to take him outside and get photos like the one below. As time went on he started living mostly in the bottom of his cage. Sometimes he would have seizures which became more frequent in the fall. Opal had lived 51 days less than 30 years. (9) Smith, P. William (1987). "The Eurasian Collared-Dove arrives in the Americas". American Birds 41(5), 1370-1379.